Shop for authentic South Carolina Flags. We offer indoor and outdoor South Carolina flags in durable nylon. Our outdoor flags are finished with a canvas heading, while indoor flags are finished with a lined pole hem and your choice of with or without fringe. We also offer indoor and outdoor South Carolina flag sets. The South Carolina State Flag has an indigo background with a white crescent moon to the top left and a white palmetto tree at its center. The indigo color is a reference to that of a uniform worn by South Carolinian soldiers during the American Revolutionary War, or American War of Independence. The Palmetto tree is native to South Carolina, otherwise known as the Carolina Palmetto or Swamp Cabbage, the tree is a distinctive emblem of South Carolina, where it flourishes due to the state's climate. 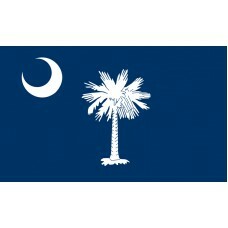 The origin of the crescent moon design on the South Carolina State Flag is subject to debate. Both the palmetto and crescent emblems were designed by Colonel William Moultrie in 1775. Moultrie had been asked by the Revolutionary Council of Safety to design a flag for the South Carolinian territories, to identify its soldiers in the war against the British empire. Moultrie reportedly said that some of his militiamen had worn silver crescents on the front of their caps, which inspired him to include the design on the flag. These militiamen later won the Battle of Charleston, which is one of the most iconic in US history, and one that paved the way for the country's independence from Britain. South Carolina is in the southeastern USA, on the Atlantic coast. Charleston is its largest city, but its capital is Columbia, which lies to the north west of Charleston in the geographical center of the state. South Carolina officially separated from North Carolina in 1729. Before that, the colony of Carolina was part of the English and British part of what became the USA. Carolina is a reference to King Charles II of England, who granted a charter for ownership of the region in 1663 in the name of his father, King Charles I. South Carolina was the 8th of the 13 states to ratify the US Constitution, in 1778. It has distinct geographical regions, much like other states in southeastern USA. In the south east, the Atlantic Coastal Plain is known as the Low Country. This is where the state's rivers flow into the Atlantic. There is a central plateau called the Piedmont region, meaning foothills. This runs southwest to northeast through South Carolina, and Columbia is at its northwestern edge. Past this are the Blue Ridge Mountains, part of the Appalachian range. South Carolina is host to many different eco-regions.